خامنه اصل, شاهین, مقصودی, مهری, پیغمبر دوست, نعیمه سادات. (1397). مروری بر روش‌های افزایش بازدهی سلول‌های خورشیدی حساس شده با رنگ از طریق بهینه سازی فوتوالکترودهای دی اکسید تیتانیم. دو فصلنامه انرژی های تجدیدپذیر و نو, 5(2), 45-56. شاهین خامنه اصل; مهری مقصودی; نعیمه سادات پیغمبر دوست. "مروری بر روش‌های افزایش بازدهی سلول‌های خورشیدی حساس شده با رنگ از طریق بهینه سازی فوتوالکترودهای دی اکسید تیتانیم". دو فصلنامه انرژی های تجدیدپذیر و نو, 5, 2, 1397, 45-56. خامنه اصل, شاهین, مقصودی, مهری, پیغمبر دوست, نعیمه سادات. (1397). 'مروری بر روش‌های افزایش بازدهی سلول‌های خورشیدی حساس شده با رنگ از طریق بهینه سازی فوتوالکترودهای دی اکسید تیتانیم', دو فصلنامه انرژی های تجدیدپذیر و نو, 5(2), pp. 45-56. خامنه اصل, شاهین, مقصودی, مهری, پیغمبر دوست, نعیمه سادات. مروری بر روش‌های افزایش بازدهی سلول‌های خورشیدی حساس شده با رنگ از طریق بهینه سازی فوتوالکترودهای دی اکسید تیتانیم. دو فصلنامه انرژی های تجدیدپذیر و نو, 1397; 5(2): 45-56. سلول‌های خورشیدی تجاری عمدتا از ویفرهای تک بلوری یا چند بلوری سیلیکون ساخته می‌شوند. عیب اصلی این سلول‌ها هزینه های بالای مواد اولیه و روش ساخت است. سلول‌های خورشیدی حساس شده با رنگ (DSSC) با توجه به هزینه ساخت کم، سازگار با محیط‌زیست و عملکرد رقابتی، بطور گسترده‌ای مورد مطالعه قرار می‌گیرند. اجزای تشکیل دهنده DSSC زمینه‌ی رسانا، رنگ، فوتوآند، کاتالیست و الکترولیت است. هر جزء اهمیت خاص خود را دارد، اما از میان آنها فوتوآند جزء اصلی است که بازده تبدیل انرژی را تعیین می‌کند. تا به امروز، مواد مختلفی به عنوان فوتوآند به کار رفته‌اند. 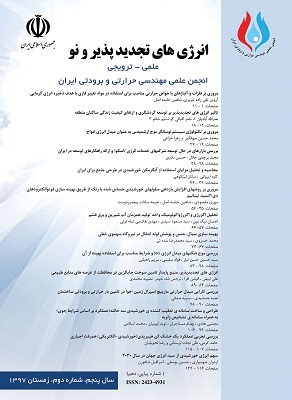 در این میان، فوتوآندهای نانوساختار با مساحت بزرگ، انتقال الکترون بالا و بازترکیب الکترونی کم، ساخت DSSC ای با بازده تبدیل انرژی بالا را تسهیل می‌کنند. بهبودهایی که در فوتوآندها صورت می‌گیرد، برای تحقق مواردی همچون سطح ویژه بالا، اثر پراکندگی نور بالا، افزایش کیفیت فصل مشترک، انتقال الکترون سریع و افزایش ظرفیت جمع‌آوری بار است. J. H. Yum, P. Chen, M. Grätzel, and M. K. Nazeeruddin, "Recent Developments in Solid‐State Dye‐Sensitized Solar Cells," ChemSusChem, vol. 1, pp. 699-707, 2008. S. Mathew, A. Yella, P. Gao, R. Humphry-Baker, B. F. Curchod, N. Ashari-Astani, et al., "Dye-sensitized solar cells with 13% efficiency achieved through the molecular engineering of porphyrin sensitizers," Nature chemistry, vol. 6, p. 242, 2014. J. Gong, J. Liang, and K. Sumathy, "Review on dye-sensitized solar cells (DSSCs): fundamental concepts and novel materials," Renewable and Sustainable Energy Reviews, vol. 16, pp. 5848-5860, 2012. A. Hagfeldt, G. Boschloo, L. Sun, L. Kloo, and H. Pettersson, "Dye-sensitized solar cells," Chemical reviews, vol. 110, pp. 6595-6663, 2010. T. R. Source: ISI Web of Science. M. Dubey and H. He, "Morphological and Photovoltaic Studies of TiO2 NTs for High Efficiency Solar Cells," in Scanning Electron Microscopy, ed: InTech, 2012. Y. Bai, H. Yu, Z. Li, R. Amal, G. Q. M. Lu, and L. Wang, "In Situ Growth of a ZnO Nanowire Network within a TiO2 Nanoparticle Film for Enhanced Dye‐Sensitized Solar Cell Performance," Advanced Materials, vol. 24, pp. 5850-5856, 2012. M. R. Golobostanfard and H. Abdizadeh, "Hierarchical porous titania/carbon nanotube nanocomposite photoanode synthesized by controlled phase separation for dye sensitized solar cell," Solar Energy Materials and Solar Cells, vol. 120, pp. 295-302, 2014. S. Satapathi, H. S. Gill, S. Das, L. Li, L. Samuelson, M. J. Green, et al., "Performance enhancement of dye-sensitized solar cells by incorporating graphene sheets of various sizes," Applied Surface Science, vol. 314, pp. 638-641, 2014. C. Karthikeyan, M. Thelakkat, and M. Willert-Porada, "Different mesoporous titania films for solid-state dye sensitised solar cells," Thin Solid Films, vol. 511, pp. 187-194, 2006. I. Saurdi, M. Mamat, M. Musa, M. Amalina, M. Abdullah, and M. Rusop, "Photoanode of nanostructured TiO 2 prepared by ultrasonic irradiation assisted of sol-gel with P-25 for dye-sensitized Solar Cells," in Micro and Nanoelectronics (RSM), 2013 IEEE Regional Symposium on, 2013, pp. 258-261. D.-Y. Kim, B. N. Joshi, J.-J. Park, J.-G. Lee, Y.-H. Cha, T.-Y. Seong, et al., "Graphene–titania films by supersonic kinetic spraying for enhanced performance of dye-sensitized solar cells," Ceramics International, vol. 40, pp. 11089-11097, 2014. C.-S. Chou, F.-C. Chou, F.-C. Su, and P. Wu, "Design and development of electronic-and micro-structures for multi-functional working electrodes in dye-sensitized solar cells," Advanced Powder Technology, vol. 25, pp. 1679-1687, 2014. A. G. Niaki, A. Bakhshayesh, and M. Mohammadi, "Double-layer dye-sensitized solar cells based on Zn-doped TiO2 transparent and light scattering layers: Improving electron injection and light scattering effect," Solar Energy, vol. 103, pp. 210-222, 2014. A. Usami, "Theoretical simulations of optical confinement in dye-sensitized nanocrystalline solar cells," Solar Energy Materials and Solar Cells, vol. 64, pp. 73-83, 2000. J. Ferber and J. Luther, "Computer simulations of light scattering and absorption in dye-sensitized solar cells," Solar Energy Materials and Solar Cells, vol. 54, pp. 265-275, 1998. S. Hore, C. Vetter, R. Kern, H. Smit, and A. Hinsch, "Influence of scattering layers on efficiency of dye-sensitized solar cells," Solar Energy Materials and Solar Cells, vol. 90, pp. 1176-1188, 2006. Y.-J. Chang, E.-H. Kong, Y.-C. Park, and H. M. Jang, "Broadband light confinement using a hierarchically structured TiO 2 multi-layer for dye-sensitized solar cells," Journal of Materials Chemistry A, vol. 1, pp. 9707-9713, 2013. Q. Zhang, D. Myers, J. Lan, S. A. Jenekhe, and G. Cao, "Applications of light scattering in dye-sensitized solar cells," Physical Chemistry Chemical Physics, vol. 14, pp. 14982-14998, 2012. J. Qian, P. Liu, Y. Xiao, Y. Jiang, Y. Cao, X. Ai, et al., "TiO2‐coated multilayered SnO2 hollow microspheres for dye‐sensitized solar cells," Advanced Materials, vol. 21, pp. 3663-3667, 2009. P. J. Cameron and L. M. Peter, "How does back-reaction at the conducting glass substrate influence the dynamic photovoltage response of nanocrystalline dye-sensitized solar cells?," The Journal of Physical Chemistry B, vol. 109, pp. 7392-7398, 2005. H. Yu, S. Zhang, H. Zhao, G. Will, and P. Liu, "An efficient and low-cost TiO2 compact layer for performance improvement of dye-sensitized solar cells," Electrochimica Acta, vol. 54, pp. 1319-1324, 2009. N. Huang, Y. Liu, T. Peng, X. Sun, B. Sebo, Q. Tai, et al., "Synergistic effects of ZnO compact layer and TiCl4 post-treatment for dye-sensitized solar cells," Journal of Power Sources, vol. 204, pp. 257-264, 2012. P. Roy, D. Kim, I. Paramasivam, and P. Schmuki, "Improved efficiency of TiO2 nanotubes in dye sensitized solar cells by decoration with TiO2 nanoparticles," Electrochemistry communications, vol. 11, pp. 1001-1004, 2009. H. Elbohy, A. Thapa, P. Poudel, N. Adhikary, S. Venkatesan, and Q. Qiao, "Vanadium oxide as new charge recombination blocking layer for high efficiency dye-sensitized solar cells," Nano Energy, vol. 13, pp. 368-375, 2015. X. Chen, L. Liu, Y. Y. Peter, and S. S. Mao, "Increasing solar absorption for photocatalysis with black hydrogenated titanium dioxide nanocrystals," Science, vol. 331, pp. 746-750, 2011. T. Su, Y. Yang, Y. Na, R. Fan, L. Li, L. Wei, et al., "An insight into the role of oxygen vacancy in hydrogenated TiO2 nanocrystals in the performance of dye-sensitized solar cells," ACS applied materials & interfaces, vol. 7, pp. 3754-3763, 2015. G. H. Guai, Q. L. Song, Z. S. Lu, C. M. Ng, and C. M. Li, "Tailor and functionalize TiO2 compact layer by acid treatment for high performance dye-sensitized solar cell and its enhancement mechanism," Renewable Energy, vol. 51, pp. 29-35, 2013. Y. Kim, B. J. Yoo, R. Vittal, Y. Lee, N.-G. Park, and K.-J. Kim, "Low-temperature oxygen plasma treatment of TiO2 film for enhanced performance of dye-sensitized solar cells," Journal of Power Sources, vol. 175, pp. 914-919, 2008. H. J. Kim, J. Kim, and B. Hong, "Effect of hydrogen plasma treatment on nano-structured TiO2 films for the enhanced performance of dye-sensitized solar cell," Applied Surface Science, vol. 274, pp. 171-175, 2013. P. Das, D. Sengupta, B. Mondal, and K. Mukherjee, "A review on metallic ion and non-metal doped titania and zinc oxide photo-anodes for dye sensitized solar cells," Reviews in Advanced Sciences and Engineering, vol. 4, pp. 271-290, 2015. Y. Duan, N. Fu, Q. Liu, Y. Fang, X. Zhou, J. Zhang, et al., "Sn-doped TiO2 photoanode for dye-sensitized solar cells," The Journal of Physical Chemistry C, vol. 116, pp. 8888-8893, 2012. S. Kundu, P. Sarojinijeeva, R. Karthick, G. Anantharaj, G. Saritha, R. Bera, et al., "Enhancing the Efficiency of DSSCs by the Modification of TiO2 Photoanodes using N, F and S, co-doped Graphene Quantum Dots," Electrochimica Acta, vol. 242, pp. 337-343, 2017. F. P. García de Arquer, A. Mihi, D. Kufer, and G. Konstantatos, "Photoelectric energy conversion of plasmon-generated hot carriers in metal–insulator–semiconductor structures," ACS nano, vol. 7, pp. 3581-3588, 2013.